Our parks and trails make Anchorage a great place to live. Your help is needed to protect these important resources. Anchorage parks are much-loved and need our stewardship. These natural places improve our quality of life by providing open space to socialize, recreate, and enjoy family activities. Our parklands provide many other benefits including habitat for fish and wildlife, wetlands that soak up stormwater and help maintain good water quality, and a world class trail system which contributes to the health of our community and economy. The Municipal Parks and Recreation Department has over 200 parks, more than 250 miles of trails and greenbelts, and over 10,000 acres of parklands. The Department also manages pools, recreation centers, playgrounds, and multi-use fields. Without our help, these parklands and recreation facilities can quickly go from well-used to worn out! Throw your trash in bear-resistant waste cans or take it home with you. Scoop the Poopâ€”please clean up your dog's waste using poop stations located along the trail. Adopt-A-Park, Adopt-A-Trail, or Adopt-A-Garden to help maintain one of your favorite places. 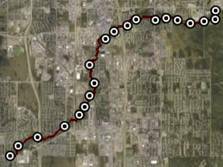 Join Trail Watchâ€”observe and report trail hazards and other potentially unsafe situations. 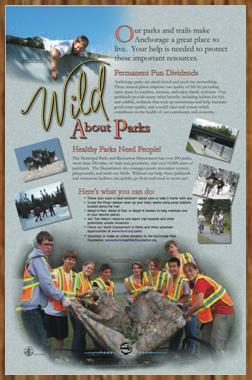 Check out Youth Employment in Parks and other volunteer opportunities at www.muni.org/parks. Volunteer or make an online donation to the Anchorage Park Foundation, www.AnchorageParkFoundation.org.